While there is no treatment for autism, those of you who follow along know that I have a definite strategy for managing it. 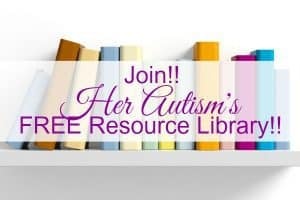 You can check that out in my post, “My Strategy for the ‘Treatment’ of Autism.” In this strategy is the idea that you should treat everything else and with that idea comes the use of many resources. We have tons of doctor appointments, or at least it seems like it. In addition, there are those occasional meetings with the schools my girls attend for purposes of managing their 504 plan or in the case of college, accommodations. So much fun. As I go to all of these appointments (GP, psychologist, psychiatrist, gynecologist, PT, etc. ), and work to schedule others (ex. endocrinologist), I was reminded again of the things I have given up (not willingly!) as a result of the health issues of myself and my kiddos – these costs of autism and mental health care, if you will! For most people the first things that come to their minds when they think of these costs of autism and mental health care are money and time. Our health issues are expensive, costing between $5,000 and $10,000 per year (convert that to vacations and it’s one nice vacation or several smaller ones, at least that is what I guess since our money goes to doctors, therapists, and pharmacies), and I am fully aware that is a drop in the bucket compared to what some spend. 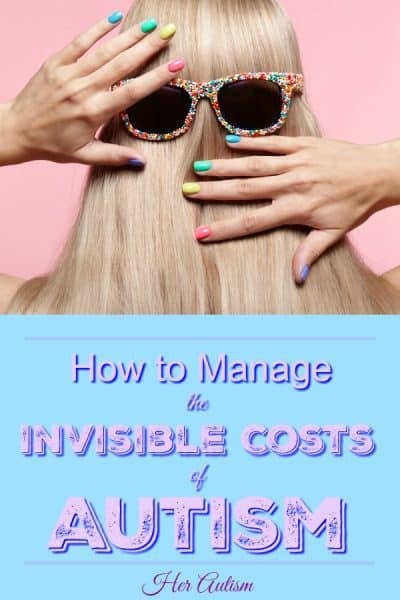 Some studies show that the costs to manage autism can be staggering. Because of the gravity of this issue, I will write a couple posts soon about the best time to manage your medical expenses and places to catch up with others financially. Let me say that again…insane amounts of time. 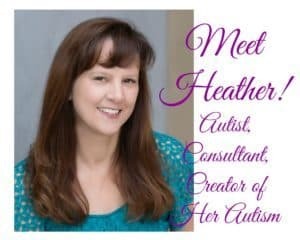 Most of our appointments are not for autism per se, as there is no treatment and the people in my family that have it are really high functioning. But the other medical and mental health issues – oh my! An while we do have autoimmune issues on both sides of our family, our health issues way exceed that. Imagine going to the dentist to find that the roots of your front teeth are too short, and you should expect the two front teeth to fall out at some point. (Ever have that dream that all your teeth are falling out? Talk about a trigger!) My daughter got to live that appointment. Or finding out that your rather inactive teenage daughter has somehow torn something in her knee? What about having trichotillomania and learning that you have a form of alopecia as well. Talk about bad news. Ugh. But to the point, you learn about all of these issues by going to the doctor. I have no idea how many appointments we average in a week, and frankly, I don’t want to know. Those appointments with school personnel also take time. Not just the time to attend, but also the time to prepare, because as many of you know if you go in unprepared, you will come out without a satisfactory result. The costs of autism and mental health care in terms of time are costs I probably will never calculate. I just don’t want to know! After starting down this road with psychological assessments for myself and my girls, I became aware that something had shifted, but it took me some time to really put it into words. We had always had lots of health issues and lots of appointments, but this shift into mental health issues really changed the course of our care and quite honestly, the way we were treated by health care providers, school personnel, family and friends. I finally realized the sources of my frustration during the fourth quarter of 2016 when my family had over 30 doctor and therapist appointments. At that point, I was truly feeling the pain of having paid these invisible costs. They were beginning to really to grate on me and became totally overwhelming. After putting them into words, they became so much easier to deal with. So besides money what are the costs of autism and mental health care? Yep. You give up your privacy. And it hurts. It is everywhere. We encounter people in our business at school, in the offices of our health care providers, and with family and friends. In my mind this has been the steepest cost of autism – acknowledging that we spend less than a good many people! I have been asked things like what I fed my kids for breakfast and why I didn’t have a job. Seriously? One school found out that I traveled on business and that I left my school age daughters home alone. The school nurse accused me of leaving a 12 or 13 year old home alone overnight. When I pointed out that she was with her 18 year old sister the entire time, the woman backed off, but my point is that once we entered the mental health realm, the game changed. Consider just how many people you have to work with in the school system. The principal, the head of the Special Education Department for the school district, the 504 coordinator, guidance counselors, advisors, teachers, and let’s not forget all of their staff have a role to play. Let’s see, over the course of having kids, our health care providers have included general practitioners, geneticists, neurologists, endocrinologists, gynecologists, hematologists, psychologists, psychiatrists, spinal surgeons, dentists, ophthalmologists, a developmental therapist, an aquatic therapist, physical therapists, a speech therapist, an occupational therapist, social workers, pharmacists, and all of their staffs. In addition, all of the records for those go through their billing offices, and insurance companies. Few people talk about or think about the fact that to get medical or mental health care, you are exposed to all kinds of poking and prodding, physical, mental, psychological…. It all too often moves from just the questions about the issue for which you are seeking care and moves on to questions about how you live your life. We have done a lot of sharing. A lot. I left a psychologist appointment with my daughter just the other day feeling like I had been kicked in the gut. It was our first appointment (and last) with her, and she was a handful. Judgments began after knowing us for all of about 10 minutes and by the 20 minute mark, it became clear that our extensive issues are beyond her toolbox. Yet, her judgments continued. By the end of the appointment we learned that her mother had bipolar disorder (one of the things that led my daughter to counseling) and that she had some very negative opinions about it. Not the doctor for us. Another of our doctors who really doesn’t like that the girls are on meds for things like bipolar disorder, depression and anxiety, told us he has a son with neurological issues for which he has never sought a diagnosis (for his son). Uuummm…. I have to admit that makes ME want to ask HIM questions, but I don’t because that is not my place. That is just the medical stuff. And it is just the stuff I can think of off of the top of my head. You know what all of these people want? Your information. Your personal information. And in fairness, to some extent, they need it. Full points to these providers who understand that they only should ask for the information they need to go forward. Shame on those who feel that somehow they are remotely qualified to understand the battle you are fighting and to issue judgment upon you in the few minutes (relatively speaking) that they spend in your life. Finally, let’s consider that there are friends, family, and more remotely, acquaintances who feel that just because their family won the “healthy family lottery” that they can ask personal questions and give advice to you so you can be healthy like them. I invite them to walk a day in my shoes. Or the shoes of my daughters who have totally stepped up to the plate to manage their own health care. Super proud of them! And not just for managing their health care, but also for developing heathy boundaries in doing so! I know for a fact that some of these folks would not be able to tolerate the schedule I manage. Between appointments (choosing providers, scheduling appointments, and attending them), everyone’s “bad days,” dealing with the insurance company, sending the bills to the ex-husband for partial reimbursement, etc., it’s a bunch to handle. I have witnessed several of the folks who dole out the most advice crash like a ton of bricks at the introduction of just one health issue in their family. I don’t wish this on them, I don’t rejoice at their struggle, I just wish they could extend grace to others when they have no idea the nature and magnitude of the beast with which others deal every day. It Can Feel Like Everyone Is In Your Business! Just how many people can be in your business at one time? Apparently all of them. At least that is what it can feel like. I would love to say that I can just refuse to have these people in my business, and in regard to some of them I can. But we definitely have a need for the professional health services we utilize and as my daughter wants to go to school for high school, I am stuck with the staff in the school district. The others, I largely view as optional in that if they go beyond that which is professional, they can be replaced. This concept is, by the way, surprisingly new for some of them! I used to feel like people viewed me as a good mom. We homeschooled our kids, fed them a great diet (we called it the “free, free, free diet” because it was devoid of all of the good stuff! ), and they were super well-behaved. During this period, even though they regularly had pneumonia, RSV, bronchitis, asthma, food allergies, etc., people treated us respectfully. They even applauded me for working so hard to keep the girls healthy. Loss of privacy is to be expected, but the loss of status came as a total shock. A shock which left me feeling blindsided. Ugh. Looking back I can see I was so prideful. Well, God took care of that! It is real hard to be proud while the world is letting you know you are undesirable and unwanted. Imagine if our issues were contagious!!! Goodness, who was I anymore anyway? At some point during this mess I lost myself. My sense of identity had been blasted, my reality had shifted such that my day to day life wasn’t even recognizable. I suddenly realized that how I viewed myself was the product of how others treated me. More than that and much worse, I realized just how much of my self-image was wrapped up in the successes and public image of my kiddos. So not cool. So How Do I Manage These Costs of Autism? Managing to maintain some sense of privacy is, in my opinion, the most difficult. I really struggle here. Information HAS to be shared to get the best possible care. The best way to manage privacy, I think, is it to have providers I genuinely trust. I work to identify providers I feel know and honor the line between needing more information and those who want to ask questions in order to judge us. Over the years, this need for privacy has sometimes meant we left providers who seemed like they were good in their field, but left us feeling like less than we were or like someone has just grilled us. Once or twice there have even been providers who, when I pushed back with what I felt were good boundaries assumed a somewhat threatening posture letting me know the power they held. Needless to say, our relationships with these providers ended immediately. You can hear more about how I manage appointments themselves and some of the factors that go into these decisions in my audio, “How to Manage Appointments Like a Boss,” which is available for download in the FREE Resource Library. Where loss of privacy is the most difficult for me, loss of status was the most surprising. We did nothing to cause these health issues. We are not to blame, not at fault, and yet, the judgment was swift and harsh. Boy, did I feel it. How to handle it, however, was much more difficult to sort out. While I could set boundaries with practitioners and others with whom I had relationships and protect our privacy to the extent possible, the negative views of just society as a whole toward autism and mental illness seemed impossible to control or avoid. Understanding that fact was key. I could not control other people. I could just control me. I knew I was doing all of the things any good parent would be doing, learning as fast as humanly possible how to help my family, and would do it all pretty much the same way again. Status matters even though we may not like to admit it. It opens and closes doors. I realize now, that I can’t change the world so what I do is live in the knowledge that living with what I view as discrimination beyond anything I thought possible (and yet, less than that experienced by many in our society throughout history) makes me more compassionate, more empathetic and, well, just a better person. How do I handle loss of status? In a nutshell, I remember that while the world thinks less of me, I am actually more than I was when the world accepted me. Funny, huh? Sometimes we pay a price and we get something valuable in return. That is the case with the next one. Pride. Who needs pride? When living in a prideful state, I felt good. Artificially good, I now realize. Dealing with losing the “good” feelings that come with being prideful actually stings at the beginning. As time went on, and I got used to it, however, I realized that I was growing in CONFIDENCE. Until this point in my life, I hadn’t even realized I lacked confidence! No more do I need the validation of others. I look to myself, my own measuring stick to determine how I am doing. I know that I handle a ton of difficult stuff every day. Stuff no one would ask for, and I do it with knowledge of how to handle it, with a preventative mindset, and with tenacity. I have moments I want to quit, I vent plenty, but I NEVER give up. Confidence. The most beautiful thing about it is that the opinions of the people around me may change, but my confidence is my own. Unlike pride, it does not depend on the approval of others. It has been as freeing for me as the loss of privacy has felt confining. From the paragraphs above I believe you can probably guess how I dealt with my changed self-image. I recreated it. I see myself differently, both my past self and my current self. I actually feel like a better, stronger person for these experiences and the learnings that have come with. More than that, I have different goals for my future self. The price(s) I have paid for the care and progress we have all made have been steep, but they have not been without benefit. The take home message? Life is not easy. Certainly not with mental heath issues running around in it! But the ability to identify the losses you are feeling and to learn to manage them effectively can make it not only bearable, but thrivable! (Okay, I made that word up!) In all that we have encountered, in all that has been thrown at us, we have kept our heads down and succeeded and you can too! If you want some more help, check out “How To Manage Appointments Like a Boss!! !” in the FREE Resource Library and the posts linked to above. You can do this! You’ve got it! Want to remember or share this post? Pin it to your favorite Pinterest board!